Striking, watermelon-pink, powder-puff flowers with a delicate fragrance. Huge mimosa-like pink flowers give rise to the plant's other name 'powder puff tree'. Ideal as a patio plant in a bright, sunny spot to enjoy the delicate fragrance. Leaves are light copper-coloured when new, changing to dark, metallic-green when mature. Exciting for kids - the leaves fold up at dusk. Supplied as 80-100cm standard plant. 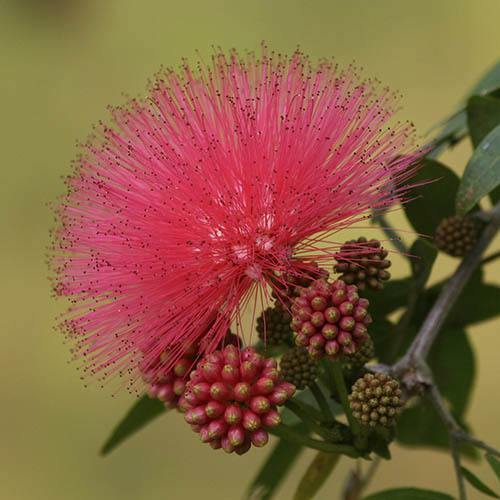 Covered in huge, watermelon-pink, fluffy flowers, and a relative of the mimosa, it's not surprising that Calliandra is also known as the Powder Puff Tree. The fragrant pink blooms of 'Dixie Pink' resemble giant powder puffs and are composed of hundreds of pink stamens emerging from a white centre, which is what give them their characteristic appearance. As an added bonus, the foliage is just as attractive with the finely divided, feathery leaves emerging flushed pink before maturing to darker green. At night the leaves fold up which kids find fascinating. As a south American native, Calliandra is a definite sun lover, and best grown where it can be kept in a sunny position and moved into a greenhouse or conservatory over winter. In fact, it's so suited for container growing that it is often selected as a specimen for bonsai. We'll send you a standard plant in a 3L pot, 80-100cm tall ready for planting. Never to allow it to dry out during the flowering period. Calliandras grow and flower best if they are grown in full sun, although they can tolerate partial shade. Plant in reasonably fertile, moist but well-drained soil. Water regularly and thoroughly, especially during the summer when it will be in growth. Well established plants can tolerate occasional periods of drought. Your Powder Puff Tree will require little pruning, just a light trim after flowering in the spring to maintain shape and a dense form.